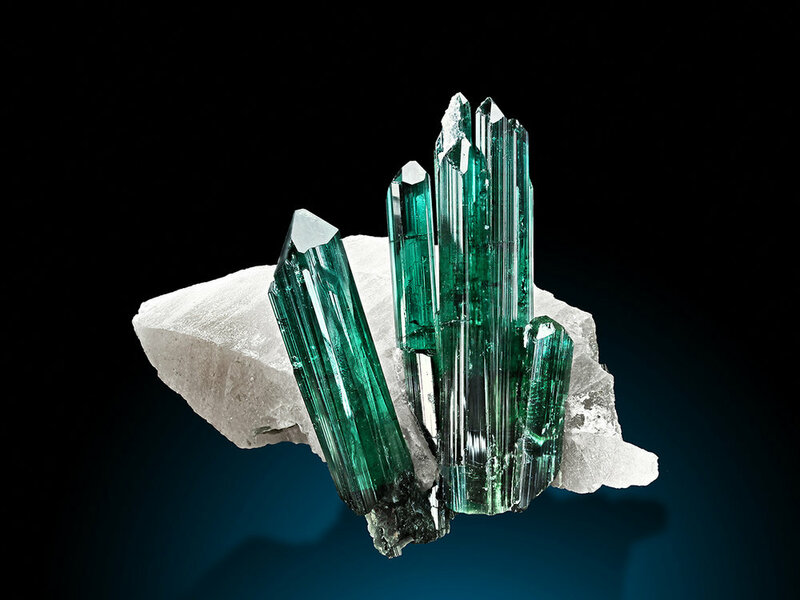 A spray of highly lustrous, sharp terminated tourmaline crystals attractively set on light grey glossy quartz. The crystals show very good transparency; I did not use any lamps, the photo was done under daylight. The color is a very attractive blue-green. The pyramidal endpoints help to give a great visual impact to the piece. One crystal shows a light layer at the top (I have to mention this because on the photo it might look like a contact or a damage; it is no contact or damage, it is just a layer). The assemble is very aesthetic and tri-dimensional. The specimen shows three invisible repairs. This is the only specimen on quartz, there is only one more specimen on matrix, all other are just clusters or single crystals. So we have to rank this one very high for this very eye-catching combination with quartz. Material from Teixerinha is not very common and usually crystals show only green color, the addition of blue color tones is new.